Night photography comes with a myriad of extra issues to add to the 101 things to remember at shutter release. Much higher ISO, narrow field of focus, and slow shutter speed are just a few of the issues that night photography brings to the night walker. We have had some rain/ice on top of our snow recently, so when I got up for some pain meds I saw this view outside. I took a few handheld shots (a tripod is better for night photography, but I didn’t want to make that much noise). Here’s one I like enough to share. Moral of the story? 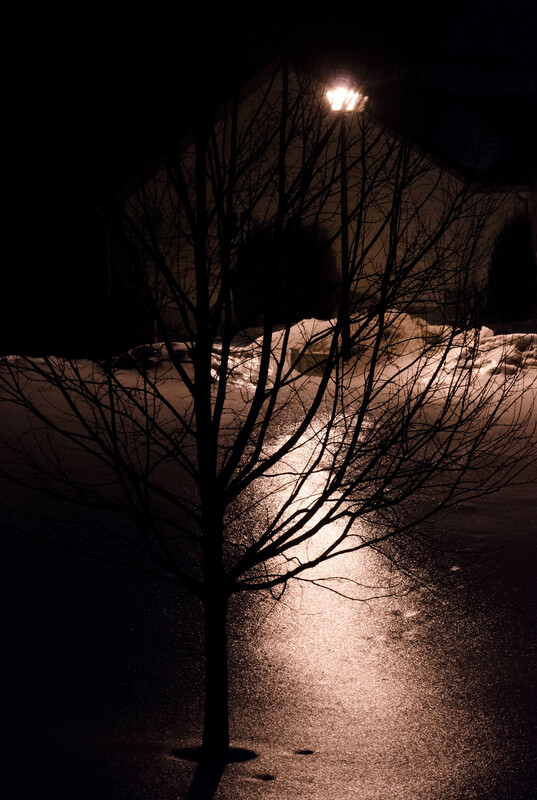 Keep your camera handy, even at night. Stunning. When I see things like this in the middle of the night I always want to stay up to soak it all up. Oooh. I missed this one (until this morning when I was cleaning out my emails). Pretty cool! Very unique.